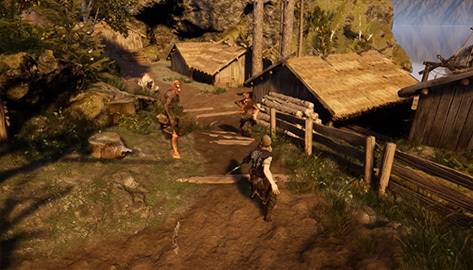 Einar is a single-player 3rd person Hack ’n’ Slash game based on the Norse mythology. The game is being developed for the PS4 by a team of 30+ students. You can attack and make combos with three different types of gods. Thor - slow but heavy damage. Tyr - quick but weak damage. My biggest contribution to the game is the combat system. We needed a very flexible system that allowed for quick iteration. Together with another student we designed an asset type for unreal that contained many variables that designers could tweak. The design has proven to be very successful and easy to use. Without the need of a programmer, a designer can take an animation, setup the FX, add audio and make attack combinations. Another reason why the combat system functions so well, has to do with the target selection system. For each attack, a designer can tweak a number of variables that generates a penalty factor. When the player attacks, a penalty factor is calculated for each surrounding enemy and attack combination. I then take the best matching attack and enemy pair that fits best for that situation.